As flooding continues in Nebraska, and as the pastor for missions and outreach at Sheridan, many people have asked about Sheridan’s response to the devastation and hardships. Our strategy has been developed over the years and we believe it is most effective, so I share it with you. During times like this, there are two chapters. First, crisis management; second, recovery for the long-term. In crisis management, first responders (police officers, search and rescue, firefighters), families, friends, and communities come together to aid those affected. Also, several wonderful organizations, like the Red Cross and Salvation Army, have highly developed systems in place to respond effectively. What we know, however, is once the initial crisis is over, these organizations finish their work and hand the baton back to the disaster victims and their community. This begins the second chapter of recovery and healing. Lutherans are known for being a part of this chapter: long-term recovery efforts following disasters of all kinds. Through our greater church partnerships, organizations like Lutheran Disaster Response and Lutheran Family Services help accompany those who are recovering and rebuilding. This includes items like critical home repair and property clean up. An example of this is Habitat for Humanity’s rebuilding efforts in the Florida Keys after Hurricane Irma hit in 2017. Our very own Sheridan mission team served through critical home repair just one month ago in partnership with Habitat for Humanity on the Middle Keys and Thrivent Builds. Our response for the recent Nebraska floods is to partner with our Nebraska Synod Disaster Response ministry and Lutheran Disaster Response by collecting offerings. If you want to donate, make checks payable to Sheridan Lutheran Church, memo: Nebraska Flood Relief. Be assured, 100% of your donations benefit those in need. In good time and at the appropriate time, we will also put together work teams that will go to assist with manual labor in affected sites as invited. The flooding is expansive and so many people are affected. I’m sure many of you have personal connections with those who have suffered loss. By all means, if you know someone who needs help now and you and others can organize to assist, go for it! 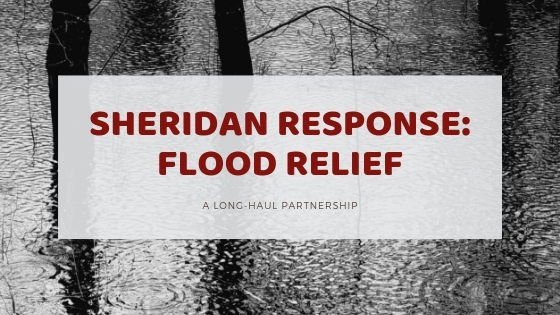 Please know in your heart that our community of Sheridan will faithfully walk ‘the long haul’ with those who have been affected by these devastating floods in our great state of Nebraska. And yes, continue to pray and remember, worship God and listen to each other’s stories. Check in on those needing encouragement. In all things, in everything you do, share the love of Jesus to all.